The growth of technology is not something Christians should miss out on. While there has been a great increase in productivity apps, games and many other programs for mobile and desktop, there has also been an increase of great faith-based apps as well. Smartphones have been known to make work and life a whole lot easier. With an open application store which gives ingenious app builders the freedom to make and distribute great ideas, we now have a big collection of resources that can help us grow in spirit too. From Bible apps to church management apps and even to prayer tracking apps, online stores are filling up with resources that can help us grow spiritually. Here is one the best Android apps Christians should probably consider getting today – Christogram. 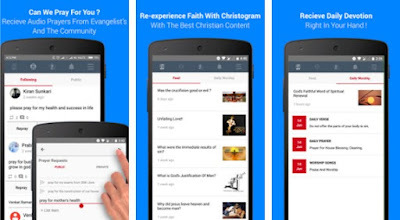 It is a Christian social app, a platform where Christians from all across the globe come to pray and get prayed. Designed with friendly user interface and beautiful graphics, it is one of the best ways to set direction in your life and get the support you need. Christogram is a revolutionary platform for Christians to engage and grow in God, a one stop destination for prayers, praise and worship with personalized content. With this fantastic Android app, you can have one of the best Christian content wherever you are, whenever you need it. It lets you share your prayer points for the community to encourage and pray for you, to add your friends and family for a more personalized experience and offers a personalized feed from your reading interests and friend recommendations from ministries across the world. Christogram features smart alerts and events information as well, so you can always know about latest prayer meeting and events, participate with them in real world or virtually through the app. If you want to be a part of this amazing community, get the app today – it is free on the Google Play Store!